North Korea 'Very Far Along' In Developing New Ballistic Missile : Parallels Many independent arms control experts suspect that North Korea will test a missile capable of reaching the continental U.S. later this year. There may not be much the U.S. can do about it. 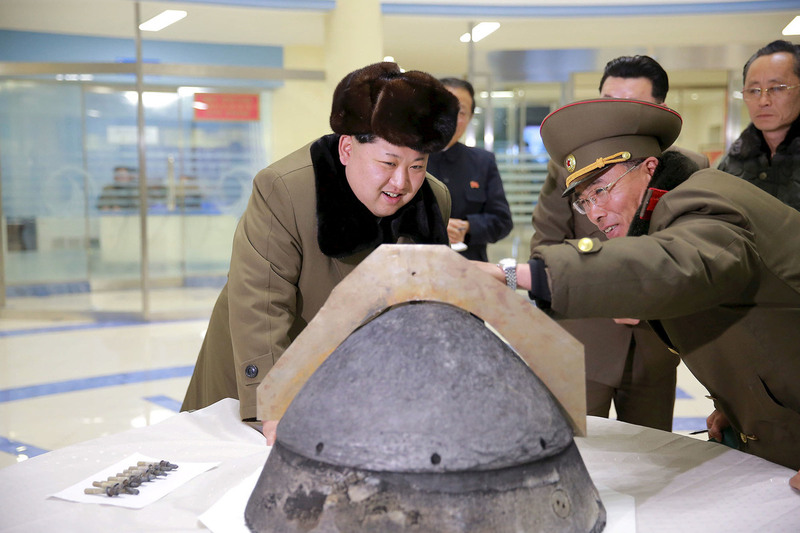 North Korean leader Kim Jong Un looks at a warhead component being developed for a ballistic missile, at an unidentified location in this undated photo released by North Korea's Korean Central News Agency on March 15, 2016. 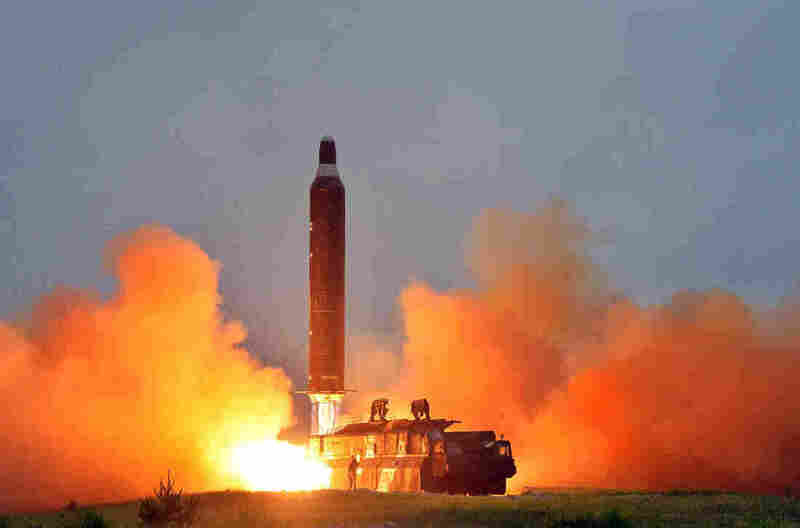 "They are very far along in their ICBM testing project," says Melissa Hanham, an East Asia researcher at the Middlebury Institute of International Studies at Monterey. "Probably we will see that they will do a flight test in 2017." If the test were successful — a big if — North Korea would join a small club of nations with ICBMs, including superpowers like the U.S., Russia and China. This undated picture released from North Korea's official Korean Central News Agency on June 23, 2016, shows a test launch of a medium-range Musudan ballistic missile. North Korea is a notoriously closed society, but the government periodically releases images and videos of its missiles. Analysts pore over that scant material and use it to cobble together a mosaic of the North's weapons program. Those reports, combined with public statements by officials in South Korea and the U.S., provide some sense of the North's progress. And there was a lot of progress in 2016, Hanham says: "There were so many tests, I need crib notes." North Korea tested a new rocket engine, based on a Soviet design, that is more powerful than anything it has used before. It also tested a heat shield of the type needed to protect a nuclear warhead as it re-enters Earth's atmosphere. In June, it successfully fired a new Musudan missile. The Musudan's range of up to 2,500 miles is short of what's needed to reach the U.S., but it appears to use some of the technology that would probably go into a larger ICBM. That ICBM has yet to be tested. Known to analysts as the KN-08 or KN-14 ("one of the challenges with North Korean missiles is that they don't tell us what they're called," says Hanham), it first appeared in a military parade in 2012. Back then, the missile was so kludged together, it looked to some experts like it could be a decoy. But in the years since, photos of the ICBM showed features that suggest it is becoming a real weapon. The missile began as a clunky, three-stage design, says David Wright, a rocketry expert at the Union of Concerned Scientists. It has since been redesigned as a simpler two-stage affair. With the new engines tested this year, it would have a range of about 7,500 miles, Wright says. "That would start to bring things like Washington, D.C., into range." Can Trump stop the test? Neither Hanham nor Wright thinks there are easy solutions available to the president-elect. Attacking the missile before it's launched would be an act of war. If the ICBM is tested to the south, as happened with North Korea's space launches, then it will be out of range of the main U.S. missile-defense system based in Alaska. Smaller ship-based interceptors are also unlikely to be able to shoot it down, Wright says. That leaves diplomacy, says Hanham. But Kim Jong Un has shown little willingness to negotiate. "There are no good options, really," Hanham says. "That's why previous administrations have struggled with it for so long." A flight test will not mean that North Korea can conduct a nuclear strike on U.S. soil. For one thing, the North's track record in testing new missiles is pretty bad, says Wright. He estimates the odds that this new ICBM will work are "probably less than 50 percent." And while the individual components may all be there, they still need to be combined into a single weapon, he adds. Many analysts believe the North has miniaturized its nuclear bomb. But Wright says it's less clear whether a North Korean nuke could survive the g-forces of a missile launch. Similarly, its re-entry system for bringing the weapon back to earth could be highly inaccurate in its current design. Perfecting an ICBM as a weapon may take several more years. Still, Hanham believes that 2017 may be a watershed year for the North. Even an unsuccessful ICBM test would send a clear message. "That's going to be really scary," she says, "not just for the region, but the American public."